Off to China today, with nine students, and another teacher. We will spend three days in Beijing, a lot of time in Kunming, a day in Dali, four days in Shaxi and three days in Shanghai. Shaxi and Shangahi are new to me, and I am looking forward to seeing both. My last trip to China was two years ago. I had a very good time, though I was experiencing China very much as an anxious first-time chaperone. I did write some poetry based on my experience, and I hope this time will give me much to think about too. I will be back on June 30, and until then this blog is probably on hiatus. 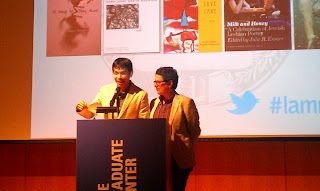 Attended the 24th Annual Lambda Literary Awards last night and presented the gay and lesbian poetry awards with J. Bob Alotta. GH, who egged me to accept Don Weise's invite to be a presenter, was there too. The lesbian poetry award went to Love Cake, by Leah Lakshmi Piepzna-Samarasinha and the gay award to A Fast Life: the Collected Poems of Tim Dlugos, edited by David Trinidad. I was too nervous, really, to enjoy the reception before the ceremony, though I was glad that GH had the chance to talk to Armistead Maupin, the recipient of this year's Pioneer Award, and to Olympia Dukakis, who was presenting the award to the author of the Tales of the City series.